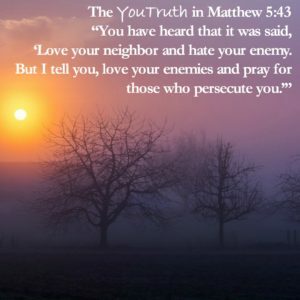 God does not want us to hate others. Period. And yet, there is a lot of hate in the world. Martin Luther King, Jr. encountered it in his day. We encounter it in ours. But the truth still remains—even those we love to hate and hate to love should be loved by us. But how do we do it? In order to love, you must be able to forgive. In order to love your enemy, you must be very good at forgiveness. Forgiveness is vital to loving in a broken world. There are simply no perfect people to love, therefore without forgiveness, you will simply be unable to love anybody for very long, if at all. We find a clue to the importance of forgiveness from one of Jesus’ most familiar teachings. He was responding to the question, “how do we pray?” But Jesus’ answer, the Lord’s Prayer, had much to say about the importance of forgiveness. In fact, Jesus taught that it is so important that God simply will not forgive those who don’t forgive others. Why this emphasis on forgiveness? Because un-forgiveness is an incredible burden. Here’s how it works. When someone wrongs you and you fail to forgive, you carry bitterness, resentment, anger, hurt feelings, all heavy burdens that God does not intend for you to carry. The struggle to carry these burdens, if attempted for very long, gives rise to hate. The magic ingredient that reverses this process is forgiveness. We may say, “I can’t do this!” and we’re right. That’s the whole point. Only God can forgive in every situation. 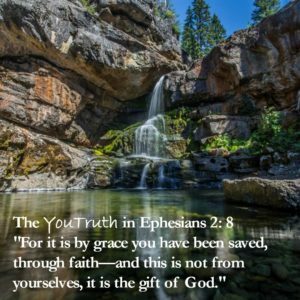 So when we say, “I can’t do this!” God says, “But I can!” When we claim Christ as our Savior and make Him Lord of our lives, we receive the free gift of forgiveness that His grace provides. This is not human forgiveness, but the eternal forgiveness of God Himself. Once we have received this gift we can share it with others. All others. It never runs out. Our ability to forgive, particularly in severe cases, reveals to the world whether we have received God’s forgiveness or not. Martin Luther King, Jr. had many opportunities to hate those that opposed him. He had countless enemies and persecutors. Yet he remembered that he had the forgiveness of His Father in heaven, and thus had what he needed to love those that opposed him and persecuted him. His Savior had commanded Him and equipped him to do so. He commands and equips us to do so as well. There are so many areas of life that are tied to performance. Your job or career is certainly that way. If you perform well, you are compensated well. If you don’t, you may not be compensated at all. If you have children, you can face a lot of performance-related feedback as a parent. If your kids behave well, you may get praises. If they don’t, you may face judgment. Just about every area of life in the world can be pressure-packed by the need to perform well. Much of the stress you may face in life can flow from this phenomenon. There is great news. Your relationship with God is in no way based on your performance. Let me restate that: You do not have to perform for God in order to secure a personal, eternal relationship with Him. The measure of God’s love that flows to you through your relationship Him is always turned on full strength. If you make mistakes, it still flows full strength. If you fail Him at times, it still flows full strength. Even in moments when you are acting purely in His will, it flows just the same. Nothing you can do can affect His love for you. It is a gift. All you have to do is receive it through faith in Jesus as your Lord and Savior. Nothing else is required. There is more great news. You can carry this gift into every corner of your life in the world. This gift has great power to dissolve away the performance-related stresses you will face. If you have a bad day at work, God is still pouring out His love, full strength. If you lose your temper with someone close to you, God is still pouring. If your child acts out at the grocery store, you guessed it, God’s gift is unaffected. What a powerful prayer this is! It is filled with so many good things, it’s hard to know where to begin! You may recognize this as a benediction prayer used in many worship services to send the congregation forth after worship. It has been used in this way for thousands of years! This illustration can work for you today, too. 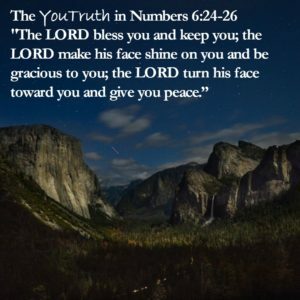 When you seek after a closeness with God, He promises that you will find yourself in His light, face-to-face with Him. And when you do, you will be in prime position to receive the grace and peace He so longs to give you. Loving enemies. Now that’s a hard one. Don’t you wish Jesus would quit teaching us to do all this hard stuff? And yet, here it is, plain and simple. So let’s see how we can pull this off. Who is the enemy, really? For our struggle is not against flesh and blood, but against the rulers, against the authorities, against the powers of this dark world and against the spiritual forces of evil in the heavenly realms. If we focus on people we may consider enemies, it is virtually impossible to love them. But if we understand that the true enemy is Satan, who has lured a person into the behavior of an enemy, then it is much easier. This doesn’t mean that you have to put yourself in harm’s way, or that you have to consider the person a close friend. It just means that you pray for the person, extend kindness when there is a safe opportunity to do so. Conflict makes enemies of people. Without conflict, people cannot truly be enemies. If your response to an “enemy’s” unkindness, is more unkindness, then you’ve made an enemy indeed. But if your response to an enemy’s mean-spirited action is forgiveness and love, the condition of conflict vaporizes. Just like it takes two to fight, it takes two to be enemies. If only one “enemy” is participating, then love can find its way into the situation, and perhaps, head off the whole enemy thing at the pass. Nicodemus, a wise religious man, saw that Jesus was someone special, even if the ruling council, of which Nicodemus was a part, didn’t think much of Him. So Nicodemus came to Jesus alone, at night, to talk to Him. Before Nicodemus could even ask his first question, Jesus issued the statement above. Nicodemus was understandably confused. None of Nicodemus’ extensive religious training had prepared him to deal with such a profound paradox. We can only assume that Nicodemus left his conversation with Jesus with much to think about, paradigms to change, and new ways of understanding God’s Kingdom to process. Later in the book of John, we find out that Nicodemus, despite the ruling council’s severe objections to Jesus’ message, became a believer and follower. We are all “Nicodemuses” in some way. And we can find great hope in Nicodemus’ story. We live in a world that doesn’t entirely agree with Jesus’ message of grace and hope. It can beat us down at times. But we can know that we can come to Jesus, in the night if we have to, and ask Him about the Kingdom. And He will tell us profound, sometimes confusing, but always amazing things about eternal life. We are all wise in our own way, and some of that wisdom will be off-target from the eternal perspective. But we can know that we can come to Jesus and ask Him which parts of our wisdom work, and which parts don’t. And He will tell us. We may come away from these encounters confused or uncertain. 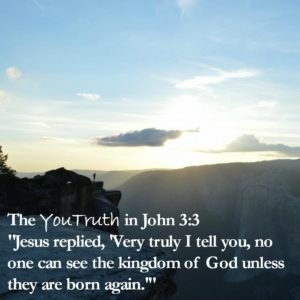 But, as with Nicodemus, if we come to Him, with a yearning to understand, Jesus will leave that yearning intact and active, exactly what is needed to become deeper believers and truer followers of Him. Not many of us are in the regular business of giving banquets. Huge lavish gatherings with hundreds of high-profile invitees and five-course meals don’t fill up the typical daily planner. Nevertheless, this passage has much to say to us. Whether we know it or not, we are all capable of throwing banquets on an incredible scale. We just have to understand banquets from the Kingdom’s perspective. A man stands on a street corner with “Hungry, please help” scrawled on a piece of cardboard torn from an old box. You respond by buying an extra sandwich at the shop down the street and hand it to him. 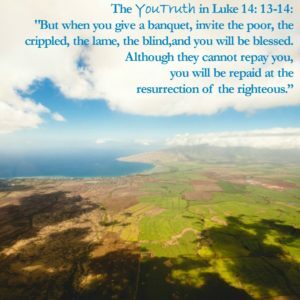 At that moment, that man has received his invitation to sit at Jesus’ banquet table. You have ushered him into the banquet hall and shown him to his seat near the head of the table. A women’s car is broken down on the side of the road. She has a crying toddler on her hip and a distraught look on her face. You respond by arranging for a tow truck, paying the towing fee, and providing some extra money to help with the repairs. That woman and her child have received their invitation to sit at Jesus’ banquet table. You have ushered them into the banquet hall and shown them to their seats near the head of the table. You see, in God’s Kingdom, we can build our banquets one person at a time. And over time, the size of the banquet you give in Jesus’ name, can be far bigger than any lavish, celebrity event the richest of the rich could throw in this world. So have at it! Get your banquet invitations ready to deliver! God will put those in your path that He intends for you to invite. So many things can cause anxiety. I’m sure you can recount situations or circumstances that created anxiety for you. You may even experience anxiety today. God has a prescription for the ailment of anxiety that has three equally important ingredients—prayer, petition, and thanksgiving. It starts with thanksgiving. This can be the hardest part when you’re feeling anxious! But this is what makes the rest of it work. The one thing you can know for certain is that God loves you immensely. He sent His Son to die for you after all. In this grand love for you, God is always working to bring about what is best for you. It’s always good to remember that God exists eternally outside of the confines of time. 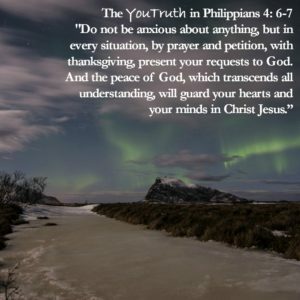 Therefore, in every case of anxiety you face, He has already worked out what is best for you in your current situation (and for every future situation you will ever face)! It’s already done! Armed with a state of thanksgiving all that is left to do is to talk to God about what is happening. Don’t hold anything back! He can handle it! Ask Him for things. Ask Him to take the anxiety away. Ask, ask, ask, all the while thanking Him for already having it all worked out. When using these three ingredients together, not only does God take away the anxiety, He does you one better. He replaces it with a piece of Himself—the peace of Himself. You will recognize it right away because, though you will experience it, you won’t be able to understand it. It will come directly from eternity and will deliver you to an eternal peace that is out of this world. Are you feeling anxious today? Try God’s remedy right away! As Christians, we are commanded to make love and faithfulness an ever-present part of our character and witness. This is not news to most of us. We hear this throughout the Scriptures. There is also something implicit in the passage that must not miss. If we don’t do something to prevent it, love and faithfulness will escape from us. It is our job to recognize this and to know what to do to prevent it. Thankfully, the verse immediately follows with the preventive measures. The instruction to bind them and write them on tablets seem a little obscure, but what they really are telling us is, start from the inside out. Writing love and faithfulness on the tablet of your heart is, to Christian believers, turning areas of our heart over to the power and leading of the Holy Spirit that dwells within us. It is surrendering our attitudes or actions that are not loving or faithful to God and asking Him to transform us into His likeness in these areas. This is the cool thing about writing upon the tablet of a believer’s heart—we don’t have to do the writing ourselves! We can turn over the writing to God who is (let’s face it) far more qualified to do the writing than we are anyway. 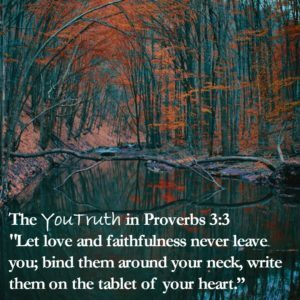 Binding love and faithfulness around your neck is taking what God has written on the inside and moving it out in the open where all can see it. It is translating the loving, faithful desires of the heart into loving and faithful actions that bless those around you in His name. It is not just wearing a cross necklace around your neck, which would seem to meet the literal expectation. It is the outward demonstration of love and faithfulness that allows those around you to understand who Jesus is and how much He loves each of those you interact with every day. Find the right place. Stay there. The Rock upon which we are stand, is not a fixed location but an ever-deepening relationship with Jesus as our Savior and Lord. This Jesus, is not a passive, stay-put Lord, but one that is always at work in the world, always directing us to those He intends for us to reach in His name. So we must set our feet on the Rock of Jesus and be ready to rock ‘n’ roll with Jesus! Standing firm is not standing still. It is resolving to keep close to Him and the work He has for us, no matter where it takes us. Lincoln did it. 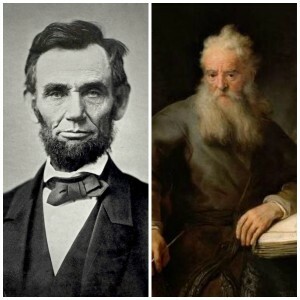 While battle plans changed, political coalitions changed, world affairs changed, He stood firm on the work He felt the Lord calling him to do—unite our nation. Paul did it. When the Spirit said, “Don’t go there,” he didn’t. When the Spirit said, “Help us over here,” he went. When he was with Jews, he remembered their customs. When he was with Gentiles, he tailored his witness to their culture. But he stood firm on the truth he preached and the fervency with which he preached it. We must do it too – We must never refuse to obey the leading of the Holy Spirit. We must be willing to follow Jesus where He leads us, to love those He loves (that’s everybody), and to proclaim Him always. We must never stand firm in the place of our choosing if it is not the place of His choosing. We must never stand in firm inaction when loving action is called for. Temptation is common to mankind. A card-carrying members of mankind, we face common temptations that every other card-carrying member faces. No one gets to claim that their temptations are more severe than anyone else’s. Our response to temptations we face is what creates seeming severity. It is not the temptation that is more severe, it is the mess that is made in response to temptation that makes it more severe. 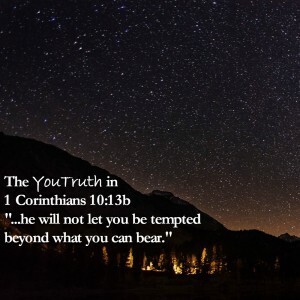 No temptation can bring you down without your permission. God always puts His governing hand on the temptations you face to ensure that they, by themselves, cannot overtake you. If you, wittingly or unwittingly, install additional weaponry to temptations, then it can overtake you. God always provides a way out. All you have to do is to take it. This can be hard to do, particularly if a pattern of being overcome has established strong resistance to his way out. Remember, it is not our lack of resistance to the temptation that is the problem. It is a strength of resistance to God’s way out that is the problem. Keep a keen eye out for The Way out today. When temptation comes, and it will come, you will be able to endure it and emerge victorious over it.